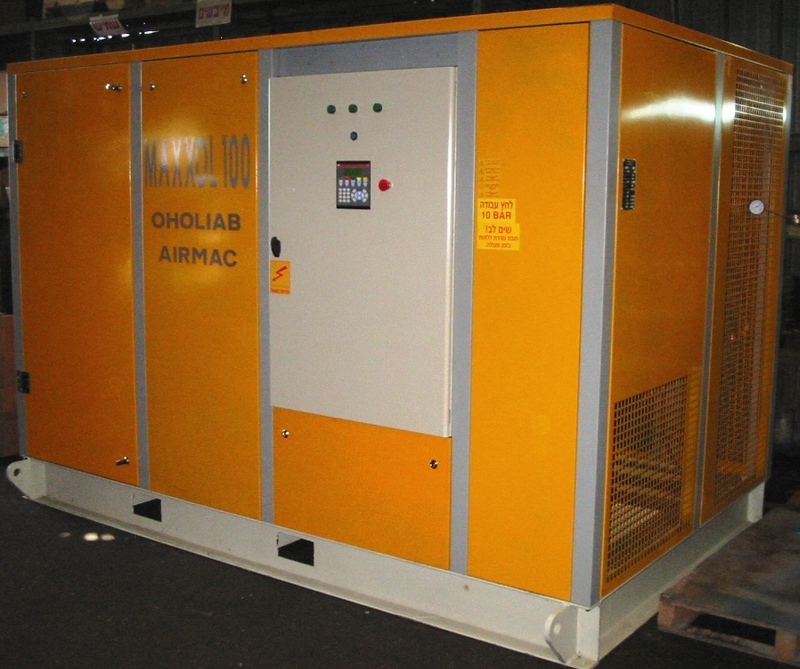 the continuous supply of oil-less compressed air & nitrogen or compatible gases . for pressures of up to 10.5 barg. conditions of 20˚C and 1 Bar (a). Above dimensions are for air-cooled compressors or water-cooled compressors, up to 220 HP (inclusive). For 250 HP and larger compressors, indicated dimensions are for water-cooled compressors. Dimensions of air-cooled compressors of 250 HP and above are available on request. Specifications are subject to change without prior notification. Performances for pressures and flows not listed above will be quoted on request. 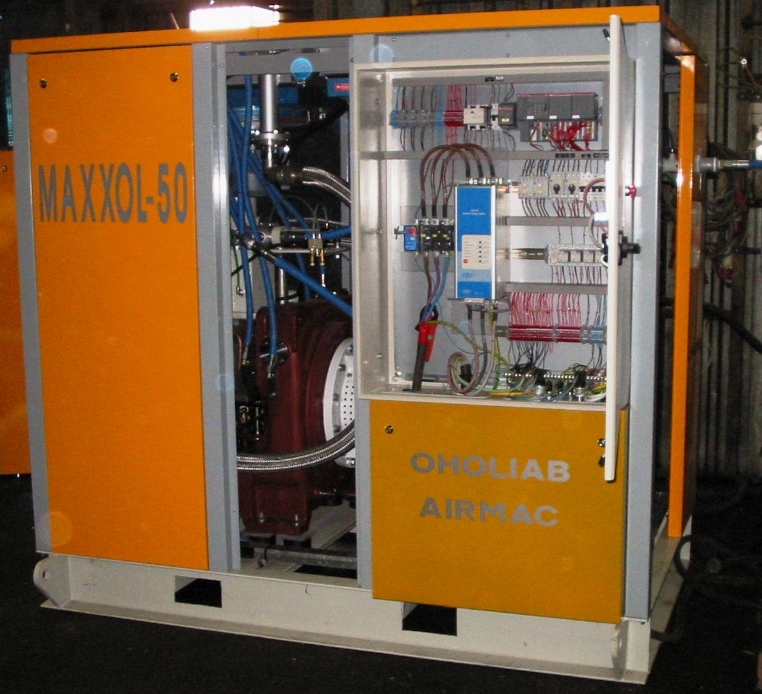 The Oholiab-Airmac MAXXOL range of compressors are heavy-duty, dry-screw type air compressors, designed for the continuous and reliable supply of oil-less compressed air and nitrogen, up to 10.5 Bar G pressure, for applications requiring clean, compressed air, with minimum maintenance. 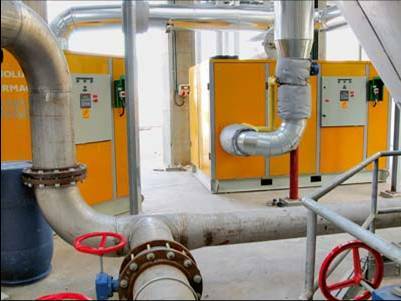 The compressors are fully factory packaged, piped and wired, and are delivered on skids that can easily be installed on site, with minimal labor. No foundation or foundation bolts are necessary. The skid-mounted machine can be readily commissioned after connection to the power mains and plant air piping system. Heavy-duty, oil-free rotary screw compression bloc, comprising two stages of compression, each with a pair of stainless steel rotors supported by massive anti-friction type bearings within a sturdy cast-iron frame. The compression chamber is separated from the bearings and running gear by seals and delivers absolutely oil-free air. The two compression stages are driven through a speed increasing gear, connected to the driving motor via a flexible coupling. Both rotors and casing are protected from within against corrosion by a patented coating, assuring reliable operation with practically no wear. Electric motor, three-phase asynchronous type, IP55 enclosure, class F insulation, rated for continuous operation. Reduced-voltage motor starter, automatic Star-Delta type. MAXXTRONIC digital control panel,touch-screen monitor with indication of operating pressures and temperatures, total and loaded run hours, operational and programmable settings, time delays, programmable auto or manual start/stop functions, connections for remote control and alarm, alarm/shutdown fault indication, programming keypad, menu selection with /start/stop/reset pushbuttons, Modbus on TCP/IP or other communication options. Capacity control system, fully automatic, including compression / unloaded run/ timed shutdown after extended unloaded run, and auto-start on renewed air demand. The pressure is monitored by a 4-20 mA transmitter and can be set to within 0.1 Bar increments. Solenoid operated valves for capacity control and blowdown of internal pressure on shutdown or unloaded run modes. Air inlet filter, two-stage, with dry, cleanable/replaceable, 3 to 5 micron filtration elements. Air suction throttling valve, with pneumatic actuator. Interstage cooler, air- or water-cooled, complete with stainless steel moisture eparator and automatic drain valve. Aftercooler, air- or water-cooled, complete with stainless steel moisture separator and automatic drain valve. Lubricating system, including a shaft-driven gear-type lubricating pump, air- or water-cooled cooler. Safety valves between the stages and at compressor discharge. Anti-vibration mounts on which stands the motor and compressor bloc assembly. Internal air piping, flexible, made of stainless steel. Dry type flexible coupling between motor and compression bloc. Acoustic canopy, to reduce the sound level to approximately 76- 79 dBa at 1 meter distance. Heavy-gauge fabricated baseplate carrying the above accessories. Air dryers for the supply of dry air at -40°/-20° C pressure dew point (heatless type), or for +3°C pressure dew point (refrigerated type). Soft-starters, digital type, complete with bypass contactor and amp-meter. Vacuum-switch contactors or soft Starters for high-voltage motors. 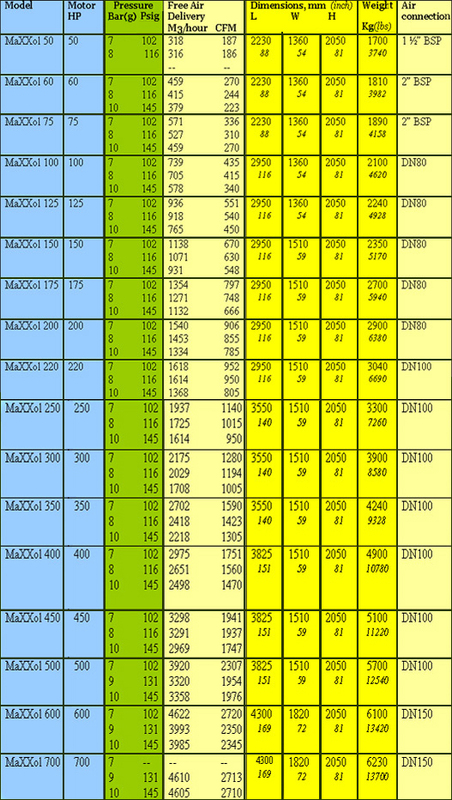 Model MaXXoL-VS, variable-speed type capacity control with built-in frequency inverter. This allows the compressor to be operated with stepless capacity variation with parallel saving in power. Specially engineered split skid sets, with or without acoustic enclosure, special cooling systems and controls custom-built to user requirements. up to 3.5 Bar g (50 Psig) and free air flows of 800 to 8000 m3/hr (470 cfm - 4720 cfm).